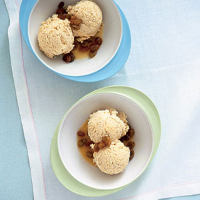 This luscious ice cream has all the buttery, toffee flavour of baked apples, with a hint of spicy cloves. You don't need an ice cream maker to make it, but if you do make it by hand you'll need to whisk it to break up the ice crystals. Preheat the oven to 220°C, gas mark 7. Put the sultanas and rum into a small pan and heat slowly, but do not boil. Remove from the heat, cool, and set aside in the fridge until needed. Using an apple corer, remove the cores from the apples. With a sharp knife, cut a line through the skin around the middle of each apple. Sit them in a baking dish. Mix the softened butter with the sugar, cloves, orange blossom water (if using) and the 3 tbsp sultanas, and push this into the apples. Pop into the oven and bake for about 30-35 minutes until very soft, puffed and brown. While the apples are cooking, make the custard base. Pour the milk and cream into a heavy-bottomed pan, bring to the boil then remove from the heat. Whisk the yolks with the sugar, then pour on the scalded milk. Mix well. Rinse out the milk-pan and strain in the custard mix. Cook over a low heat, stirring constantly for about 6 minutes or until thickened. It must not boil or it will curdle (if it does, pour it into a large bowl as quickly as possible and whisk it). Cool. Remove the apples from the oven, and cool slightly. Scoop the soft insides into a bowl and scrape in any gooey bits left in the pan. Discard the skins. Liquidise the apple in a blender until very smooth. Cool. When both mixtures are cool, fold the custard into the apple purée, transfer to an ice-cream maker and churn until very thick. Spoon into freezerproof container, cover and freeze until ready to serve. When you are ready to serve, remove from the freezer and place in the fridge for 20 minutes to soften. If you do not have an ice-cream maker, pour the chilled apple custard into a freezerproof container and place in the freezer for an hour. Take it out, soften it and whisk it using a hand whisk. Repeat this process 4 times at 30-minute intervals. Serve with the reserved rum-soaked sultanas. This recipe was first published in April 2006.